With CMS approval of Kentucky’s Medicaid 1115 waiver request, individual accountability (i.e. work requirement) is clearly becoming a bigger priority in qualifying for Medicaid. And Kentucky is not the only state moving this direction. Currently, 9 other states have similar requests approved or pending approval. The only constant for state Medicaid programs is a future of more change. While individual accountability (work requirement) also creates a mandate for healthcare providers to deepen their education outreach and impact, the elimination of the 90 day retro period (allowing healthcare providers and patients time to complete qualifying) immediately puts cash at risk for providers. In the second post of this three-part series, What’s your pivot strategy? 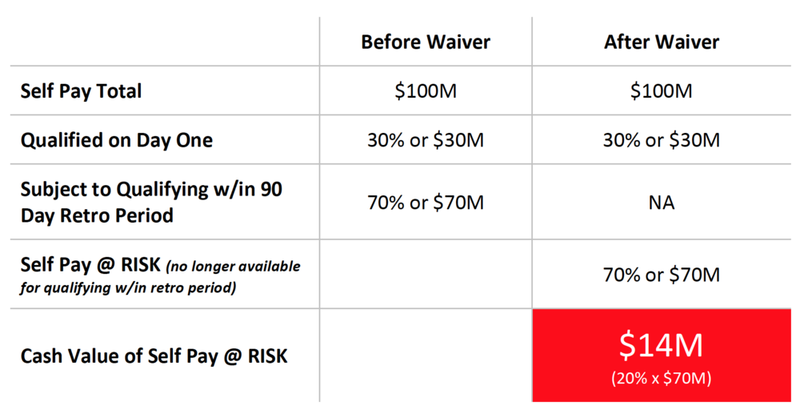 Five must-have milestones in preparing for the impact of the Kentucky Medicaid 1115 waiver, milestone #2 brought light to a new risk to cash (see below). Depending on an individual healthcare system’s actual numbers, the new risk to cash may be substantial. The reason cash is subject to new risk is that few healthcare providers have full visibility and capability to analyze and qualify patients on day one of receiving care. Yes, many healthcare systems have people, processes and maybe even some technology in place. Sometimes reimbursement is achieved. But something is still missing. Many patients leave... leave because care is complete. But an understanding of the financial responsibilities is not complete. They leave before that part of the encounter can be made clear. And so the healthcare system plummets off “cooperation cliff”; where patient cooperation drops by 33%*... also diminishing the probability of reimbursement. In any state where there is no retro period or a request for the elimination of the retro period is pending, cash now has a new risk. The problem right now, as is common in healthcare, is that providers suffer from blind spots in disparate technology and subject matter expertise. They cannot achieve real-time, holistic access, visibility, and support for the majority of financial assistance programs including Medicaid, commercial insurance, and charity programs. As noted in post #2, executing on the right pivot strategy will go a long way to modify operations to solve this challenge in better assisting patients while also preserving cash. One healthcare system in a neighboring state chose not to wait for the risk to cash to become real for them. They began their pivot strategy in 2016. A cornerstone of that pivot came in their choice to engage in an innovation project that solved their “day one” qualifying problem. With nearly 5% less self-pay patient volume (year-over-year), they achieved a 30% increase in Medicaid reimbursement. They also experienced positive feedback from patients about the help they received in better understanding their financial assistance options. It’s been quite a journey for them. They continue to become emboldened about their future fiscal health and their newfound ability to better serve the people in their community. That innovation is now a fully functioning solution available to other healthcare providers. If you have concerns about future negative impact to your cash, feel free to speak with our subject matter expert about your situation.